COOLDO vacuum consumable electrode arc furnace is a kind of electric furnace which uses the energy of arc to smelt metal in vacuum chamber. Vacuum consumable arc furnace is mainly used for melting titanium, zirconium, molybdenum and other active metals and refractory metals, but also used to heat resistant steel, stainless steel, tool steel, bearing steel. and it is considered to be one of the important means of remelting of high temperature alloy and special steel. Small Vacuum Consumable Electrode Arc Furnace temperatures can be up to 1,800 °C (3,272 °F), while laboratory units can exceed 3,000 °C (5,432 °F).Can melt various kinds of refractory metals.During the formation of droplets at the lower end of the electrode，There is a certain physical and chemical reaction that removes a part of the gas impurity.The technology characteristic of vacuum consumable electric arc furnace is melting in water cooled copper crystallizer, which overcomes the disadvantage of metal contamination with refractories.At the same time, under the condition of high water cooling, the steel liquid is solidified and crystallized, and the uniform, non shrinkage and compact ingot can be obtained.vacuum consumable electrode arc furnace，is carried out under the action of low DC voltage and high current arc.The arc plasma zone is formed between the end of the consumable electrode and the molten pool, which has a very high temperature.The end of the consumable electrode can be melted down here，Some non-metallic inclusions, such as oxides and nitrides, are removed under vacuum and high temperature.Because the technology of vacuum consumable electric arc furnace can remove gas and non-metallic inclusions and remove some harmful impurities with low melting point, the cold and hot processing properties, plasticity and mechanical properties and physical properties have been significantly improved.reduction of carbon has been removed to achieve further purification. 1,Reduce energy consumption:This greatly reduces the energy required to make steel when compared with primary steel making from ores. 2,Has good flexibility: while blast furnaces cannot vary their production by much and can remain in operation for years at a time, EAFs can be rapidly started and stopped, allowing the steel mill to vary production according to demand. 3,Small and miniaturization: convenient operation, furnace and electricity integration design,easy to transport. 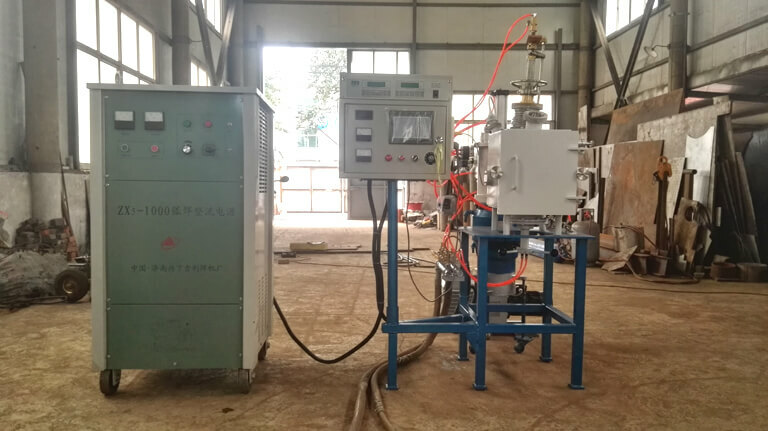 1) in the vacuum state, there is no slag and other materials between the consumable electrode and the spindle, so the melting material is not polluted when remelting. (2) when the vacuum arc furnace is smelted, the molten metal is exposed directly to the vacuum, so the degassing effect is very good, and the hydrogen, nitrogen, oxygen and other gases can be removed effectively. 3) when the vacuum arc furnace is smelted, the proportion of non-metallic inclusions in the smelting metal is lighter than that of the molten metal. It always floats on the top of the molten metal, which results in the purity of the inner structure of the ingot. 5) in the vacuum state, a large amount of alloying agent can be added, thus the high alloy steel can be smelted. can be added, thus the high alloy steel can be smelted. 6) reduce the tapping time and improves productivity, and reduce the cost of production equipment. At present, the capacity range of the vacuum arc furnace is between 15-200 t. The processes of heating, degassing, slag treatment and alloy adjustment are carried out in a vacuum state.